March 2, 2008 saw the last night of a successful play in Burbank, California’s Falcon Theater. Actor Granville Van Dusen completed an upbeat one-man performance in The Memoirs of Abraham Lincoln. The program for this event included a fulsome tribute given by ex-President and then Chief Justice William Howard Taft at the presentation of the Lincoln Memorial to Congress on May 30, 1922. “Clarity of thought and intellectual honesty, self-analysis and string inexorable logic, supreme common sense, a sympathetic but unerring knowledge of human nature, imagination and limpid purity of style, with a poetic rhythm of the Psalms – these were his intellectual and cultural traits,” Taft said of Lincoln. 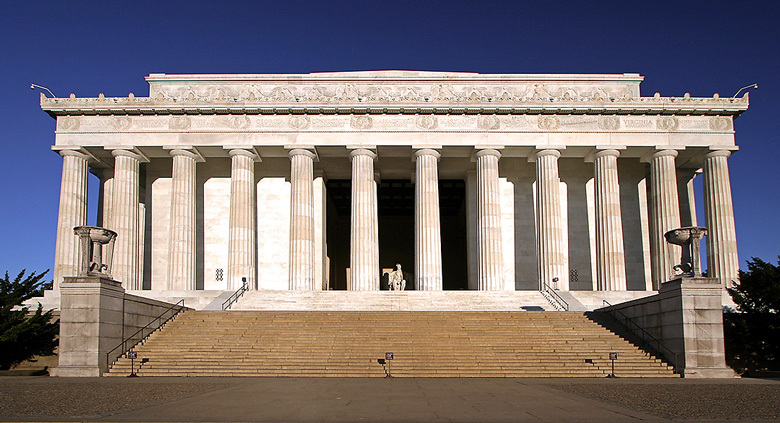 Since then, Mr. Lincoln’s stone temple in Washington, D.C. has worked for Americans seeking inspiration. The list includes Jimmy Stewart’s young Congressman Jefferson Smith pausing breathlessly before it in Mr. Smith Goes to Washington (1939) to the Duarte High School Academic Decathlon Team from small-city Duarte, California, posing there as part of a trip back east to get revved for the state and national events in 2008 (which they won!). As 2008 rushes along we can already sense a fluttering at the interface of popular and academic culture, an intimation that the Lincoln Bicentennial of 2009 has already begun. U.S. News and World Report offers a glossy “Collector’s Edition” on the newsstands titled “Secrets of the Civil War” featuring Lincoln’s pre-bearded visage next to pictures of tennis star Andy Roddick and the republican presidential candidate’s wife Cindy McCain. All of this can be a good thing for a United States that will be seeking, gingerly, to re-enter and again bring shaping leadership to the world community. It will not be done with Abu Ghraibs and Bradley assault vehicles this time, but, if the country’s new leaders are smart, a drawing upon one of the nation’s best faces to the world, Abe Lincoln of Illinois. The books keep coming. Two of the more recent entries into the popular biography genre show the span of Lincoln’s appeal. Doris Kearns Goodwin’s Team of Rivals: The Political Genius of Abraham Lincoln won the 2005 Pulitzer Prize. That same year, Joshua Wolf Shenk graced the History/Psychology shelves with his non-sensational study Lincoln’s Melancholy: How Depression Challenged a President and Fueled His Greatness. The New York Times named Shenks effort A Notable Book of the Year winning both the Abraham Lincoln Institute Book Award and a forWard Award from the National Mental Health Association. Shenk is also a member of the Abraham Lincoln Bicentennial Commission. The eagles were thus gathering well before February 12, 1809, the Bicentenary of Lincoln’s birth. Nor will this abate soon. The bicentennial of the Civil War beginning in 2011 will keep Lincoln in the public eye for the foreseeable future. Altogether, not an unhappy prospect. Ultimately, of course, there is always the mystery about Lincoln that is hard to penetrate. One reason is because genius is hard to explain. Another is because he treasured his privacy, according to Goodwin. Secrecy was no small part of his nature. Lord Louis Mountbatten once remarked that all leadership was a show, to a certain extent, but that it must be “a real show” based on real substance. In projecting confident assurance in a pettifogging democracy there must be something there to project. Modest and plain in appearance – if not jolting - Lincoln often conveyed the solemnity of an undertaker while relaxing with numerous visits to the theatre and enjoying a fund of folksy stories that he delighted telling, punctuating with his high horse-like laugh. He was, in popular culture terms, what John Fiske calls a “broad text.” That term needs unpacking. John Fiske asserts that one of the delights of the popular is the pleasure of multiplicity, of allowing a mass audience to decode artifacts even of commercial culture in creative ways. For a work of art (Mona Lisa), a piece of architecture (the Empire State Building), a catchphrase (“May the Force be with you”), a commodity (blue jeans or athletic footwear), or a children’s tale (E.T., the Narnia series) to “take off” in the pop culture it must allow the mass audience to bring their own readings to the artifact. The wider the possibility of meanings, the wider the circulation of the commodity or persona through the culture, he alleges. Fiske sees items of mass culture (a baseball bat is a piece of crafted lumber) becoming signifiers that speak to our imaginary forces (a bat actually signed by Derek Jeter is something to dream on). Icon of the Civil Religion: From Alexander De Tocqueville to Robert Bellah there have been postulations of an almost unaware Civil Religion of Americanism in the United States. It has its own cathedrals (the Capitol in Washington), sacred Scriptures (the Declaration of Independence and the Constitution) and its own founding deities (Washington, Jefferson, Franklin). Lincoln has become deeply inscribed in this almost unconscious national iconography as the martyr of democracy. He is the New Testament to Washington’s Old, almost Christ-like in his ability to bear suffering, to see the task through and then be taken from us. The Success Myth: Lincoln’s resume as an early failure as farmer, storekeeper, postmaster, novice politician and other trades is cited regularly on the Toastmaster and self-help seminar circuit. The upwardly striving Dale Carnegie was so impressed he wrote his own biography of Lincoln. Classroom Teacher’s Friend: Closely linked to the success emphasis is the well-documented Lincoln love of reading, the self-educated democratic man intent on improving himself. In his 1939 film, Young Mr. Lincoln, director John Ford had Henry Fonda (in a striking and under-rated performance) lying in the grass under a tree, his long legs resting vertically on the tree trunk reading Blackstone’s Legal Commentaries. Blackstone’s works, which Fonda-Lincoln is almost hypnotized by in the movie’s opening, was a major inspiration for the Constitution of 1787. Teachers have not completely given up on citing Lincoln “the Reader as Leader” even in the age of text-messaging and YouTube. The Canny and the Uncanny: Lincoln, the cool strategist who maneuvered the South into firing the first shot at Fort Sumter, that bloodless sacker of generals, also had a supernatural aspect to his character. His famous dreams are well-attested, most poignant, perhaps, the one of his appearing at his own coffin in the White House to the sounds of cries and mourning. This admits rustic Lincoln into the more mystical and sometimes offbeat interests of his countrymen. He attended at least one séance sponsored by his wife Mary Todd Lincoln in the White House, the poor lady trying frantically to contact the spirit of her dead son Willie. Both Donald and Goodwin attest to this side of Lincoln even while offering that it was not a major part of his character. His were more sentimental times very much attuned to the common religious impulse. In counterpoint, however, adding to that multifaceted dynamic which makes his life such a rich text, Lincoln is hailed for his “spiritual perception far above the ordinary” by today’s leading evangelical historian, Mark Noll. “It is one of the great ironies in the history of Christianity in America that the most profoundly religious analysis of the nation’s deepest trauma came not from a clergymen or a theologian but from a politician who was self-taught in the ways of both God and humanity.” Lincoln’s habit of invoking God in his public speeches was not uncommon in a land still digesting the emotional outbursts of the Second Great Awakening and the Abolitionist Crusade. That was Lincoln the legally trained lawyer staking out the moral high ground. His Second Inaugural ended with an eloquent summons “to do all which may achieve and cherish a just and lasting peace among ourselves and with all nations.” “With all nations” seems a haunting text for America’s foreign policy today, a text for the times. Thus Abraham Lincoln, a man to praise and not to bury, a rare mix of seeming near-saintliness and sagacity, the ruthless War Leader who protested war, the Emancipator in spite of himself. The very paradoxes ensure he will remain a puzzle and fascination for Americans and American popular culture well beyond his own Bicentenary. And these are the vibrations we feel when we stand at the base of the Lincoln Memorial.